Directions: to Bend Skatepark Follow Hwy 97 into Bend, take a right on Franklin. Take a right at the first 4-way stop. Follow this down to Ponderosa Park on the right. The skate park is in Ponderosa Park. 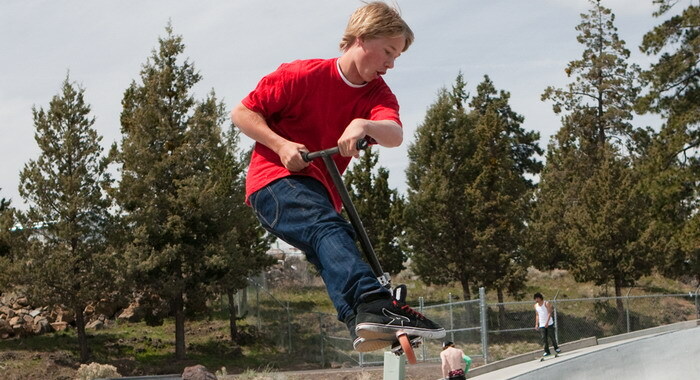 Description: Bend Skatepark is all concrete. It consists of two medium bowls, stairs, rails, and a few small quarter pipe ramps. Review: This park is okay, but could have been designed better. The bowls are fun, but are not exceptional. The pyramid feature shown in the center left of the photo is a complete waste of space. The banks are way too steep, with a set of stairs that is near impossible to hit. Bad design, sorry!! I would only visit this park if you happen to be parked around the corner. 1.5 OUT OF 5 ***The latest news is that they are re-doing this park so it might actually be worth skating in the future. Locals have told me when I was there last week that the pyramid is being demolished and a new funbox added. Special Comments: There is a new indoor skatepark in Bend which is worth visiting. There is a nice street course with various quarters (one that goes into a wall ride), funboxes, a pyramid with ledge, and various ledges and rails throughout. There is also a halfpipe section along the back that goes from a 4 ft. section all the way to 8 ft. Sick!! It is called Local 5-0 (run by C.O.S.U.) and it is right off the freeway about halfway through town. Central Oregon Skateboarding Union will be open seven days a week from 10am until midnight, running in 2.5 ½ hour sessions. Sessions will cost $10 for nonmembers, $7 for members. Membership passes will be available for $55 a year. 1307 NE 1st Street in Bend. For more information, please contact Jeremy Klaniecki or Ron Chapman at 541.388.0121. Pics to the indoor park coming soon.